This blanket is warm and fluffy and it fits my bed perfectly. The only thing I've to say negatively, is that its too warm for our spring weather. Had to take it off the bed. But, it should be fine for our fall and winter time. Snuggle up in the ultra-fluffy comfort of this plush and lofty blanket. Great for layering or as a cover on any bed, this lovely blanket is available in multiple colors and is conveniently machine washable. I love this !! And so does my 6 yo autistic angel! He doesn’t like anything uncomfortable or scratchy. This is his favorite bed blanket - although I’ve “borrowed” it a few times. It’s so soft and plush and the perfect size for his twin bed!! The shedding is unbelievable! I have washed this four times now in three weeks, but it still leaves fuzzies everywhere. We wake up covered head to toe in blue fuzz. Several pairs of my pajamas are ruined. That sounds dramatic, but I will attach a picture of a pair of pajama shorts after they were washed. My children (who don't even go in my bedroom) have the blue fuzz on their clothes and in their hair. My husband woke up choking and gagging two nights ago. The culprit was a blanket fuzzy which he inhaled while he slept. The blanket is the most awesome blanket--heavenly, really, but the fuzz/lint problem is the opposite of heaven. My duvet is ruined, our flannel sheets...I have to handpick the fuzz off as it does not come off in the wash. I ordered the light blue color, so maybe that is the only color that has this problem. I want to love the blanket so badly, but it might end up in the trash. I looked everywhere for a burgundy king sized blanket for my bed. My husband hates comforters but I wanted something pretty. This blanket is so soft, I would actually say luxurious. All of my beagles are happy with the purchase. It’s nice and warm for me and the dogs, but not to hot for my husband. Love it Berkshire Blankets are the best. Every bed in my house only has Berkshire Blankets on them. They are so soft. Trust me people once u buy one you will never buy another brand of blankets. My enire house every bed now only has Berkshire. This blanket is amazingly soft, comfortable and most importantly, warm. I am going to order another one soon. It is just the right weight as well, not one of those super heavy blankets, but again, amazingly warm. I washed this one right away before putting on the bed. Washes and dries beautifully. boy, do I love this blanket. the blanket is so light weight it is hard to believe it would be warm. it is a warm blanket. I have problems wit my L arm and rotator cuff and this blanket I can handle. It isn't heavy on my painful bits (I'm getting old) looks great on the bed. My dog is trying to take it over. I bought this blanket on a whim because I thought it was beautiful. It was much more than I expected. The color is beautiful. It is very soft and light and impossibly warm. So soft and cuddley. It's like wearing a hug. Bought this in blue. Would most definitely recommend. Would make a great birthday or Christmas gift. I purchased the Berkshire Extra Fluffy Blanket for my sons bed and he loves it. It is not too heavy but it is fluffy and he keeps very warm. It is very easy to wash and dry and it does not shrink. Love the color. I was looking for a King size fluffy blanket for my bed. This isn't exactly what I wanted but it is so light and so fluffy - I'm keeping it! Love it!! Yes, I have told a friend about these blankets. He was going to order one for a gift. And they do make an excellent gift. 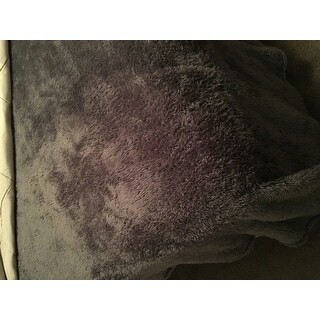 This was the worst blanket I ever bought online The blanket shedded lint balls all over everything the sheet and other blanket I had with it, not to mention it seemed like a uneven blanket not true to it's size. Thanks for the return from over stock and there advise how to fix my other blanket that got the lint balls all over. Super warm blanket. Love it! Very fluffy and light. I couldn't give it 5 stars because it sheds a lot after washing, so keep an eye on the dryer lint screen because it will fill up fast . It's still a nice blanket. This is absolutely the softest blanket ever! I have not had any pilling or shedding issues that others have mentioned and I want one in every size and color. Looks beautiful on the bed. Yes, I would recommend this blanket to a friend. Had this for 1 year now still looks new. Holds up well to washing and use even with my yorkies. Great quality. You get what you pay for. Very soft and color is perfect for my room. Very soft but doesn't keep its shape well. "How does the back look like? Is it the same furry look?" The underside is not the same as the top. It is a birthday gift for a young lady requesting a "big fluffy" blanket. I use one that's the same brand and I know this brand fits the request! Looks amazingly cozy. It's a gift for my son. I hope he loves it. "So can you answer the other person's question? Is the smoke color actually grey?" Smoke is a grey color. "The picture of the blanket that is listed as the color smoke looks lavender. Is this accurate or would one expect a grey color from something listed as smoke?" Some shades can appear differently in certain lighting, and of course every monitor is different. Just having a slightly darker screen can make things seem like a another color. Nothing will ever be perfectly accurate to real life when viewing it on a screen. I hope this helps.